Modal μ-calculus is an expressive specification formalism for temporal properties of concurrent programs represented as Labeled Transition Systems (Ltss). However, its practical use is hampered by the complexity of the formulas, which makes the specification task difficult and error-prone. In this paper, we propose Mcl (Model Checking Language), an enhancement of modal μ-calculus with high-level operators aimed at improving expressiveness and conciseness of formulas. The main Mcl ingredients are parameterized fixed points, action patterns extracting data values from Lts actions, modalities on transition sequences described using extended regular expressions and programming language constructs, and an infinite looping operator specifying fairness. 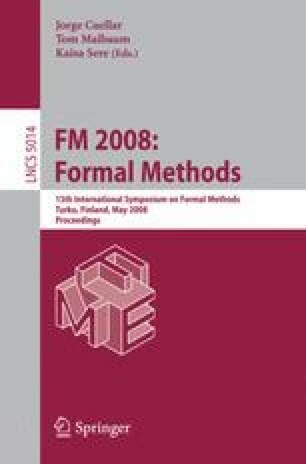 We also present a method for on-the-fly model checking of Mcl formulas on finite Ltss, based on the local resolution of boolean equation systems, which has a linear-time complexity for alternation-free and fairness formulas. Mcl is supported by the Evaluator 4.0 model checker developed within the Cadp verification toolbox.